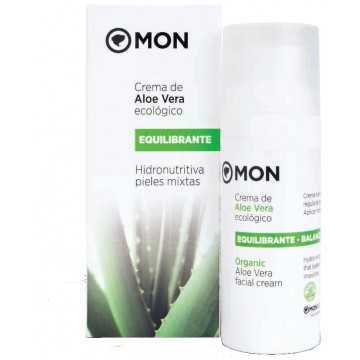 Aloe Vera Facial Cream Mon Deconatur. It has a balancing, purifying and regulating effect. Suitable for mixed skins. Provides hydration and nutrition. It has a balancing, purifying and regulating effect. Suitable for mixed skins. Provides hydration and nutrition at the same time. No perfumes and no dyes. Made with Aloe Vera, Hamamelis extract, Arnica and essential oils of Ylang-ylang, Lavender and Lemongras. Use daily as a treatment cream in the morning and evening. Apply on face, neck and décolleté. Aloe Barbadensis Leaf Extract * (Aloe Barbadensis Leaf Juice), Propylene Glycol, Caprylic / Capric Triglyceride, Cetearyl Etyloxyanoate, Glycerin, Denat Alcohol, Cetearyl Alcohol, Glyceryl Stearate Extract, Hamamelis Leaf Extract Virginiana, Flower Oil Cananga Odorata, Allantoin, Leaf Oil Citratus Cymbopogon *, Lavender Oil * Angustifolia (Lavender) *, Polysorbate 80, Isohexadecane, Acrylamide / Sodium Copolymer Acryloyldi¬methyltaurate, Sorbitan Oleate, Hydroxyethyl Cellulose, Sorbitol, Cellulose , Sodium acetate, isopropyl alcohol, sodium benzoate, potassium sorbate, tropolone, imidazolidinyl urea, caprylyl glycol, 1,2-hexanediol, eugenol, linalool, geraniol, limonene, benzyl benzoate, benzylsilicylate, citral, citronellol, farnesol. * Ingredients are from organic farming. COSMOS ORGANIC certified by Ecocert Greenlife according to the COSMOS standard available at http // COSMOS.ecocert.com. 99.17% of the total ingredients are of natural origin. 20.97% of the total ingredients come from organic farming.